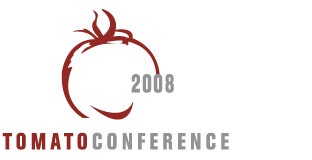 May 2008: The Tomato Conference 2008, hosted by Syngenta Seeds Vegetables, attracted 350 producers, traders and retailers from over 23 countries to debate issues around tomato production, discuss challenges in the tomato retail supply chain and highlight the benefits that tomatoes bring to consumers. The success of the conference reflects the expected rise in spending on premium products – including tomatoes. The conference, held at the NH Conference Centre in Noordwijkerhout, Holland, was a forum for attendees to share innovative views on market trends in the production and consumption of tomatoes, as well as on nutrition and the health benefits tomatoes bring to consumers. Major market trends were highlighted at the two-day event, such as the impact consumer demand for all things organic is having on the market. Another major market shift is towards on-the-go food consumption in Europe, with a nine percent rise in on-the-go consumption expected by Datamonitor by 2011. New and innovative tomato varieties were showcased at the conference, including the Kumato and the Dunne. The conference featured several keynote speeches by leading industry experts. Quality presented on the link between the tastes of different tomato varieties and their specific marketplace. Mart van Grinsven and Ton Teerling of Syngenta moderated the discussions. There were also several outstanding workshops. Master chef Angelique Schmeinck presented a workshop on different techniques in preparing various tomato varieties. Margaret Everitt from Reading University led a stimulating workshop on what composes taste and flavour in fresh tomatoes. Attendees also had the opportunity of seeing tomato production at first hand. They visited the Center Bleiswijk, the heart of Dutch tomato production. Growers, packers, traders and retailers discovered new tomato varieties, such as Tycamone, Dunne and Eugenia tomato. Last but not least, a large-scale tasting lunch gave attendees the opportunity to appreciate and compare the taste of different varieties. Tomatoes were eaten raw and as part of recipes, depending on their type.